The results of our most recent Cityparents survey gave a clear insight into how many City professionals rate their current health and wellbeing. While 60% of respondents say their physical health is either ‘excellent’ or ‘good’, the same is true for only 55% of respondents when asked about their mental health, with another 37% rating this as merely ‘fair’. 55% of respondents reported either having experienced mental ill health in the past or experiencing it at present - this is a huge increase (33% up) on last year’s figures and shows supporting employee mental health should be an area of high priority for City firms1. The higher figures this year may be attributed in part to higher levels of awareness, possibly encouraged by some high profile, recent campaigns across the City to reduce the stigma attached to mental ill health. 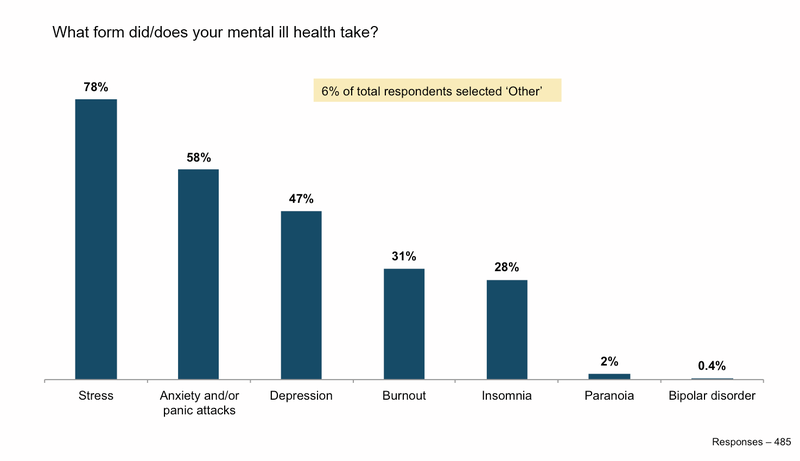 Figure 3 below shows the most common forms of mental ill health in the City reported by our survey participants. 66% said they did not disclose their mental ill health to others at work; for the vast majority this was out of concern about how this would be received and the potentially negative impact on their career. More than one professional described disclosure as "professional suicide" whilst another simply commented "it's not done". Shockingly, one stated "insomnia/stress/burnout are so common in the industry they are not noteworthy" whilst another "thought it was normal to feel like that". A minority chose not to disclose because they didn’t feel the need to or felt this was a personal matter unrelated to work.